잘 듣고 ‘the superlative’ 최상급 표현 사용법을 영어로 배워봅시다. 오늘은 동물의 왕국의 왕을 뽑는 서아프리카 이야기를 들어보도록 하겠습니다. 이야기를 듣기 전에 Session Vocabulary를 살펴보고 단어 뜻을 확인해봅시다. 이야기를 들어며 아래 질문에 답해보세요. 1. 동물들은 왕을 어떻게 정하나요? 2. 결국 누가 왕이 되었나요? 3. 여러분이 보기에 왕이 될 자격이 있다고 생각하나요? 잘 듣고 여러분의 대답을 확인한 뒤 아래 스크립트와 비교해보세요. 안녕하세요? The Storytellers에 오신 것을 환영합니다. 저희 프로그램에서는 전세계의 이야기들을 들어보고 영어도 배우는 시간을 가지고 있습니다. 저는 손보람입니다. 오늘의 이야기는 서아프리카 이야기 인데요. ‘카멜레온 왕’이야기 입니다. 동물들이 왕을 선택하는 이야기 인데요. 이야기를 듣기 전에 여러분의 이해를 돕기 위해 단어 몇가지를 알려드릴게요. ‘A lion’사자, ‘a wolf’ 늑대, ‘fierce’ 치열한, ‘sneaky’ 교활한, ‘a race’ 경주..입니다. 동물들이 왕을 어떻게 정하는지 잘 들어보세요. Once upon a time, all the animals of the world lived together as friends. But they didn’t have a king, so they decided to choose one. First they thought the lion could be king, but the others were scared because he was the fiercest of all the animals. Then they thought the wolf could be king, but the others were scared because he was the sneakiest of all the animals. So they decided to try another way. All the animals would race each other to a sacred tree far away in the mountains, and the fastest animal, the first one to touch the tree, would be king. 자 잠시만요. 지금까지 동물들이 사자와 늑대는 무섭기때문에 왕이 될 수 없다고 했고 대신 신성한 나무까지의 경주를 하기로 했는데요. 왜 이런 결정을 했을까요? 이 부분만 다시 들어볼게요. The others were scared because he was the fiercest of all the animals. The others were scared because he was the sneakiest of all the animals. The fastest animal, the first one to touch the tree, would be king. 자 다음으로 무슨일이 있었는지 들어볼게요. 도움이 될만한 단어 몇 개 알려드릴게요. ‘Hare’ 토끼, ‘chameleon’ 카멜레온, ‘clever’ 영리한, ‘match’ ~에 맞추다, ‘jump’ 점프하다..입니다. 자, 누가 왕이 될까요? The day of the race arrived. All animals, from the greatest to the smallest were there. Soon after the start of the race, the hare was far ahead of the others and reached the tree first. 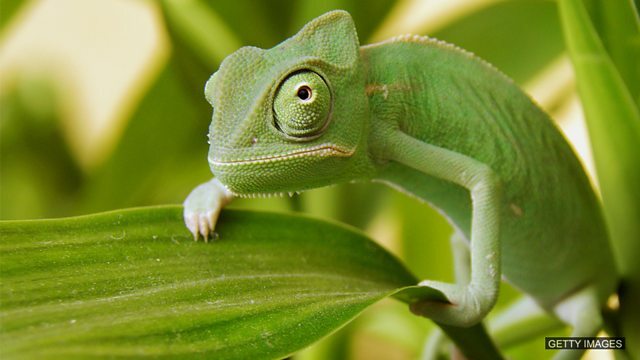 This was the chameleon, the cleverest of all the animals. He had changed his colour to match the hare's, and had jumped onto the hare’s back without anyone noticing. Then he jumped onto the sacred tree before the hare could touch it. The animals were very angry – the hare was the angriest of all – so they left their new chameleon king all alone. ‘A king without subjects is no king’, said the loneliest king of all. 자, 카멜레온이 토끼와 다른 동물들을 다 앞서서 왕이 되었네요. 그런데 모두 카멜레온에게 화가 나있어 국민이 없는 왕이 되어버렸네요. 이야기의 부분을 다시 한 번들어보고 최상급 표현을 다시 들어볼게요. All animals, from the greatest to the smallest were there. This was the chameleon, the cleverest of all the animals. The hare was the angriest of all. 여기서 ‘the’와 그 뒤에 ‘-est’도 다 들으셨나요? 자 이제 여러분도 오른 배운 표현을 사용해볼 수 있겠어요? 한 번 시도해보세요. 오늘 이야기도 재미있게 들으셨나요? The Storytellers와 함께 해주셔서 감사합니다. 다음주에도 또다른 이야기와 함께 영어배워보아요. 바이! What do you think the moral of the story is? Come and tell us in our Facebook group! 이야기의 교훈은 무엇일까요? 저희 Facebook 그룹에 서 이야기 나눠요.